Our road trip began on a cold morning in Mugumu, Tanzania, at Giraffe Garden Hotel, where I’d spent the night, having arrived the day before from Mwanza, via Bunda and Butiama (also in Tanzania). After a quick breakfast, my travel mates and I jumped into our cars for the short 40 km ride to the Ikoma gate of the Serengeti National Park, Tanzania’s oldest and most popular national park. Our destination was Arusha, where most of my travel companions lived, but the road to Arusha would take us through both the Serengeti National Park and the Ngorongoro Conservation Area. As it would be my first time visiting the world-famous Serengeti, I was EXCITED! To put things in perspective, as one of my travel companions reminded me, we weren’t going for a game drive through the Serengeti; rather, we would simply be driving through, staying on the main road. Nonetheless, just getting a chance to see the Serengeti seemed to me like reason enough for excitement! 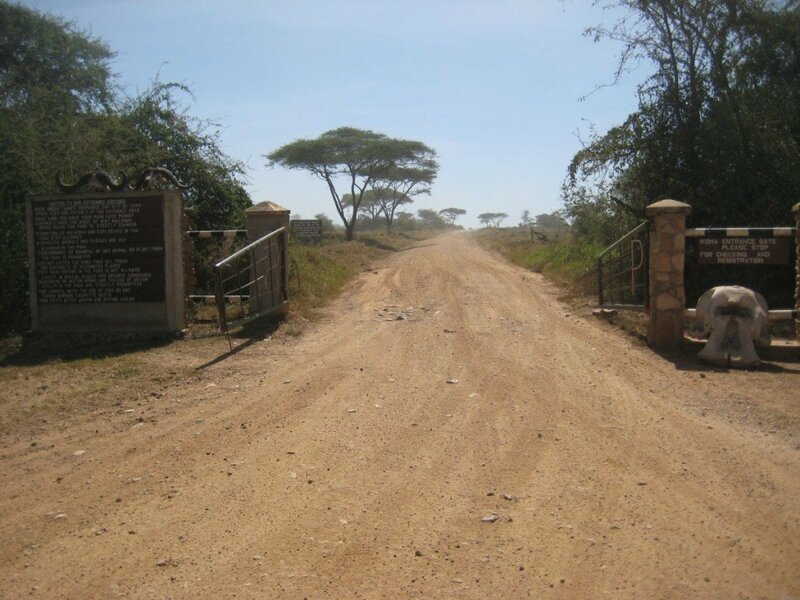 Within an hour, having made a quick detour to the Serengeti Cultural Centre, we entered the Serengeti National Park. Having caught a glimpse of the park the previous day as we approached Bunda (the Serengeti National Park’s Ndabaka Gate is a few minutes outside Bunda and a 2-hour drive from Mwanza), I was not surprised to see woodland savanna as we entered the park. Within no time, we came upon giraffes munching on treetops. While crossing a small bridge, a few minutes later, we saw a herd of hippos mucking about in thick muddy water. Since I was in the mind frame that we weren’t on a game drive, I felt lucky that I’d already seen two large animals within 15 minutes of entering the park. 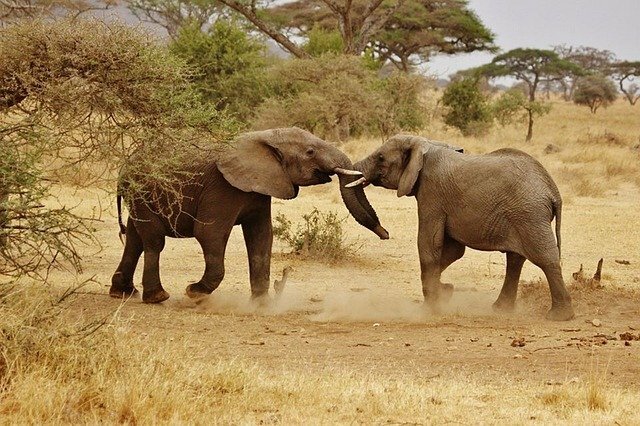 We continued driving through the Serengeti and yet again came upon more animals—this time one of the Big Five: a herd of elephants. Game drive or not, we slowed down to take a closer look. In all honesty, I am not an animal lover by any stretch. Although I have visited a number of Tanzania’s national parks, it’s almost always been because of someone else. Still, there’s nothing quite like watching animals in the wild. As our vehicle slowed down, the excitement in our car grew. We quieted down not to startle the elephants, grabbed our cameras and peered keenly through our windows. Anyone who has ever gone game watching knows what the feeling is like: your heart begins to race a little and the silence is enveloping, as you gaze in fascination at the magic of nature. We watched the elephants for a while until they walked away behind some bushes. The spell broken, we too continued on our way. Again, we drove for some time until we came to a place where we saw cars lined up in the distance, obviously watching something. Since we were in the Serengeti, we knew it had to be an animal. We debated for a while about whether or not to join them, but in the end our curiosity won over. As soon as we got there, we realized what they were looking at: a leopard walking in the grass. 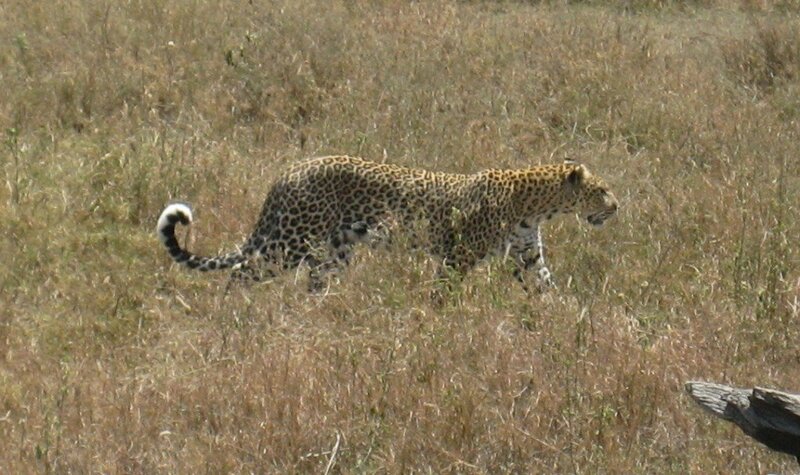 To understand how rare it is too see leopards in the wild, one of my travel companions, a wildlife biologist with over 20 years experience working in the African wild, said that this was the first time she was getting to see one. Forgetting temporarily that we were just passing through, we threw all restraint to the wind and became full-fledged travelers on safari. We raised the roof of the car, stood on our car seats, got out our binoculars and cameras, and watched in captivation. At first the leopard was far away and we hoped it would come nearer, but as it got nearer, we hoped it wouldn’t do something terrifying like jump on our car or, even worse, try to get inside. Rather, it walked casually in front of the cars and crossed the road to the other side, where it abruptly stopped. Not knowing much about the animal kingdom, I thought it had stopped simply because it felt like it. The experts in the car, however, suspected it had stopped because it had spotted something. It had. Hidden under a nearby bush was a rasp of guinea fowls. The leopard stood at attention for a while, as though debating whether or not to attack the guinea fowls. Obviously, it must have decided against it because as suddenly as the leopard had stopped, it turned around, crossed the road, and returned from whence it came. The spectacle over, we resumed our journey. The woodlands faded away as we entered the Seronera Valley, the Serengeti National Park’s central valley. With fewer trees, the Serengeti’s “endless plains” became more apparent. In Seronera, we saw all manner of antelopes: hartebeest, Thomson’s gazelles, Grant’s gazelles, and bachelor herds of impala. And then, we came upon zebras—zebras in an unending line both to our left and to our right. 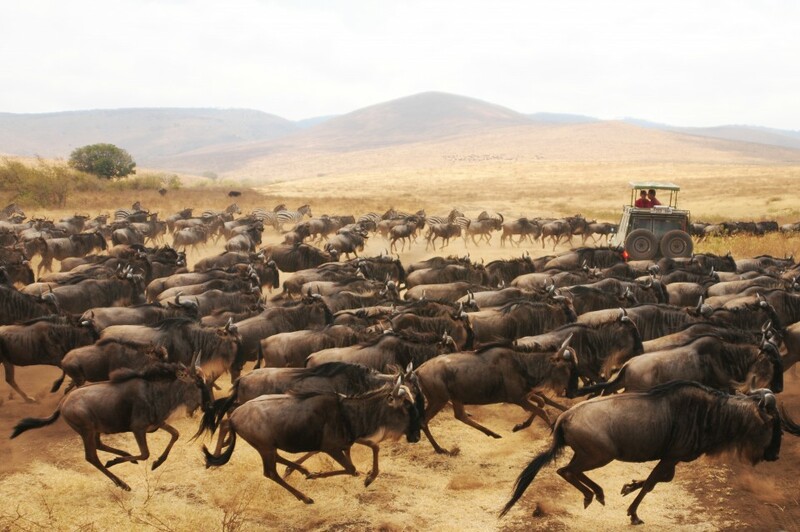 The Serengeti is host to the largest mammal migration in the world, known simply as the wildebeest migration. Every year, year after year, more than 1.5 million mammals—wildebeest, zebra, and gazelle—cycle through the Serengeti ecosystem; including the Serengeti National Park (in Tanzania), the Ngorongoro Conservation Area (also in Tanzania), and the Maasai Mara National Reserve (in Kenya); in search of water and greener pastures. Being one of the top 10 natural travel wonders in the world, I had heard of the Serengeti wildebeest migration before but had no hopes of seeing it on this trip, given that we were just driving through and it was October, the driest month in the Serengeti, when most migratory animals are not expected to be on Tanzania’s side of the Serengeti ecosystem but rather in the Maasai Mara, in Kenya. To be honest, the wildebeest migration I saw only involved a hundred or so zebra and wildebeest—these were the procrastinator animals (commonly referred to as the tail-end of the wildebeest migration). Still, it was a wonder to behold. How did these animals know to start moving? 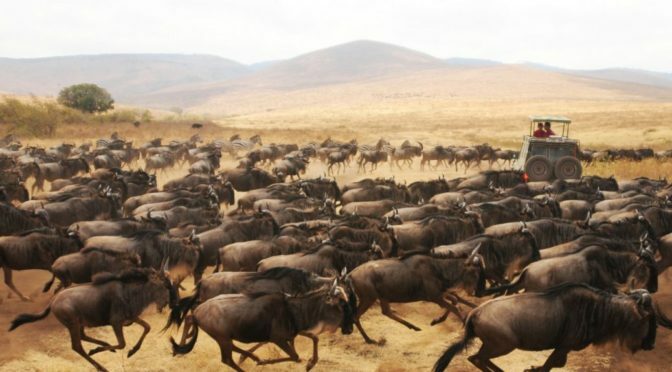 Who led the wildebeest migration? How did they know what direction to travel in? What kept them in line? I made a mental note to see the Serengeti wildebeest migration, in its full glory, as soon as possible! We continued through the Seronera Valley almost uneventfully, stopping only once to look at a cheetah, perched on top of a water tank, preventing a water truck from drawing water. We watched the standoff for a few minutes, but seeing no impending resolution, we left and made our way to Naabi Hill, where we stopped for a bathroom break, visited the Visitor’s Information Centre, and took care of the formalities necessary to exit the Serengeti and enter the Ngorongoro Conservation Area. As we entered the Ngorongoro Conservation Area, I noticed it looked much like the Serengeti except it was a bit hillier. The most notable difference was that people lived in the Ngorongoro Conservation Area, whereas we hadn’t seen any living in the Serengeti. 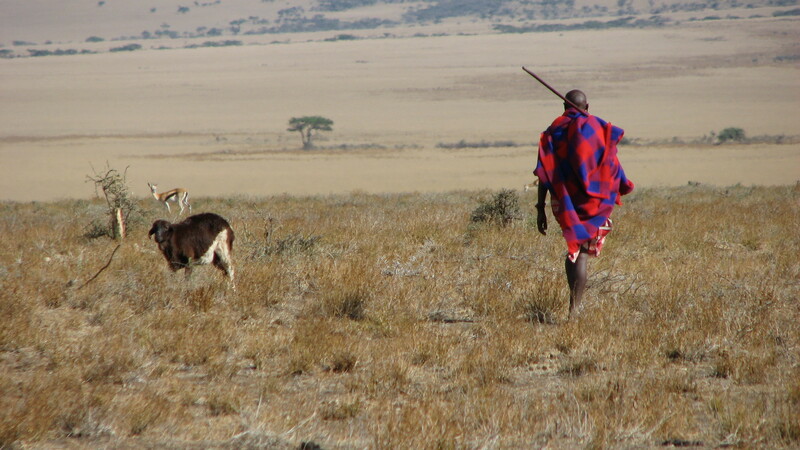 Here, we saw Maasai tending to their livestock—sheep, goats, and camels—and generally going about their everyday existence, while we also continued to see wild animals like ostriches and baboons. We drove through the Ngorongoro Conservation Area for about two hours before we finally reached the rim of the Ngorongoro Crater. We had not planned to visit the floor of the crater, but still we stopped at the rim to take a look, wonder at the grandeur of nature, and of course, take pictures. The Ngorongoro Crater (or more accurately, caldera) looked as majestic as I remembered it when I last visited three years earlier. After the short stop, we got back into our cars, drove directly to the main gates of the Ngorongoro Conservation Area, and exited the Ngorongoro-Serengeti ecosystem. Needless to say, the three-hour journey to Arusha, via Mto wa Mbu was anticlimactic, considering all we had seen earlier in the day. 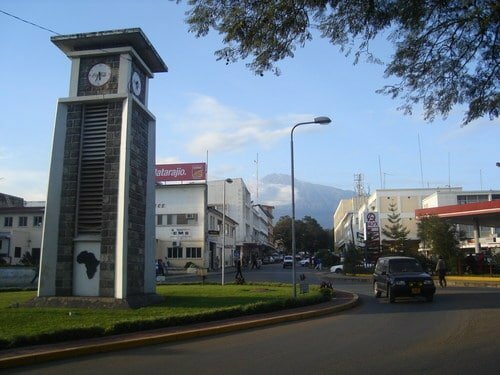 Luckily for me, I had something to look forward to: I would be visiting Arusha, a town I love, for the first time in three years. We finally arrived in Arusha, much to my delight, eight hours after our departure from Mugumu. And thus ends the story of my road trip from Mugumu to Arusha. Although I completed this trip in a day, if I were to do it all over again, I’d spread it out over several days spending at least one night in the Serengeti and dedicating a full day to discovering all that the Ngorongoro Conservation Area had to offer. For more information about these magnificent nature reserves, please visit their official websites (here for the Ngorongoro Conservation Area). That’s if from me. If you’ve gone on a similar road trip before and would like to share your experiences, I’d love to hear all about it in the comment section below. Previous PostMwanza, Tanzania: 7 Things to Do Around Rock CityNext PostTEDxDar–Who Killed Zinjanthropus? This was a very well written and descriptive wall post. The way you were able to put your words together and describe the beautiful sights that you were able to experience on this trip was riveting. These experiences are not given to many people especially in the United States where much of nature’s beauty has been torn down for buildings and modernization. Reading the animals that you saw along with the pictures, made it seem like I was actually there and was able to see the same beauties you were blessed to see. After reading your post, it brought me back to some of the beautiful sceneries that I have been so lucky to see. Most of them were not in the United States and it’s a shame that all of the nature that once covered the land has disappeared. Your post was able to emphasize the kind of awe that it inspired within you when you traveled around these parks and makes me want to also see these animals. I’m very glad I took the time to read your amazing post. After reading it, I hope to be able to travel to Africa sometime in my life and visit these parks sometime. 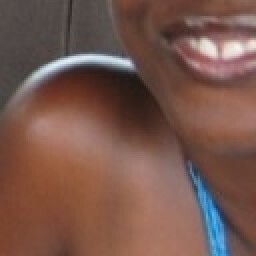 Welcome to ChickAboutTown! I’m glad you enjoyed this post. I hope it inspires you to visit the Serengeti National Park and the Ngorongoro Crater one day! When you mention beautiful sceneries and the US in the same sentence, you make me think of some of the stunning sceneries I saw while traveling by train through New England (especially during Fall!). Although a lot of nature in the US has been destroyed by urbanization, I think there’s still a lot to see if you make a point to look out for it. Welcome to Chick About Town ! I am glad you enjoyed this post. Please share it with your friends and followers on social media–I’d very much appreciate it.